Poor parenting leads to children wasting time with media according to recent news headlines. In this post, Stephanie Medley-Rath discusses the digital divide and some of the questions left unanswered by news reports. I learned from the New York Times that wasting time is new divide in digital era on Twitter. The crux of the argument is that most Americans now have access to the digital world, which includes computers and Internet. What is different is how these tools are being used by poor and well-off families. First, parents poor parents are blamed for not better monitoring and not having the knowledge of how to better monitor their children’s use of the computer. In contrast, more well-off parents are portrayed as clearly having it all figured out. It’s not like well-off parents never received surprise phone bills in the hundreds of dollars for smurfberries and lemonade for cartoon giraffes or anything like that. Clearly, the more well-off are better at monitoring their children’s use of computers. My parents did very little monitoring of my computer usage. That could be because it involved using dos to get to exciting games of solitaire and minesweeper and my Internet access while living at home consisted of a dial-up connection that you paid for by the hour…. It is an interesting time to be a student of higher education, or perhaps an individual wanting to be a student of higher education. Across the world, universities are aligning themselves with conservative political entities as they raise student tuition and cut student support. In this post, David Mayeda reports on a recent student protest in Aotearoa/New Zealand, illustrating how state police continue to act in violent ways when faced with peaceful protests, and asks further, what future lies ahead for those who will not be able to afford a university education. In Chile, hundreds of thousands of students and concerned citizens have been protesting for nearly a year, upset with the country’s highly privatized education system. As in many other regions, in Chile, if one lives in economic stress, securing a university education is highly unlikely. Likewise, the past few weeks in Montreal, Quebec, Canada, hundreds of thousands of protestors have been speaking out against proposed tuition hikes and newly imposed laws that restrict fundamental freedoms of assembly. And as covered here in SociologyInFocus last year, University of California students were pepper sprayed by an officer while sitting peacefully in protest of tuition hikes at the system’s Davis campus, while a week before, Berkeley students were struck by police with batons. Below is some of the more benign footage I took on Friday 1 June at a University of Auckland student protest before being told to put away my iPad by police, or be arrested myself. With all these student protests and conflicts with police happening across the globe, what is going on? I fly coach. I can’t afford those expensive tickets. So I put up with little leg room and a measly bag of nuts so I can get from point A to point B. But what happens when the class of ticket you purchase equates to your life or death? In this post, Bridget Welch revisits how this was the reality for many passengers on the Titanic. “It was called the ship of dreams. And it was. It really was.” So intones the actress who plays the elderly Rose in the now rereleased in 3-D Titanic (because, I don’t know about you, but I really want to feel like Leonardo DiCaprio is coming out of the screen at me). 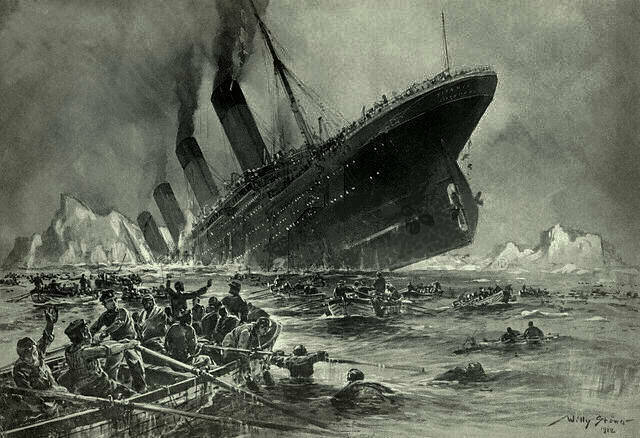 April 15, 1912 — now just over 100 years ago — in a ship that set off with 2,233 souls on board hit an iceberg and sunk resulting in the death of 1,530 people. This catastrophe has been retold countless times in films and books. Like many others of my generation, it was Leo and Kate flying at the front of the ship (with, perhaps unfortunately, Celine Dion warbling about how her heart will go on in the background) that was my entrance into this social epic. In fact, much of what I knew for a long time was because of that production. Let’s examine what the film teaches us. The heart of the story (besides of course the “Heart of the Ocean” which you can now buy) is a love story between star-crossed lovers. While Romeo and his Juliet were caught up in a familial squabble, Kate and Jack are doomed because of their difference in social class. Kate, the newly poor aristocrat who needs to marry to refinance her way of life, gives us entry into the upper class area of the ship. No doubt luxurious and comfortable, the people are snobby jerks. Kate is trapped and boxed in by the requirements of her social milieu and is only able to escape by touring the 3rd class areas with Jack. She flees her proper life and to go drinking, dancing, posing nakedly, and sexing it up with Jack. Message: Wealthy = Boring and Trapped. Poor = Fun and Free…. In this post, David Mayeda, takes look at an example of global stratification, where fishing companies from higher-income countries strip resources from poor, local fishermen off the coast of Sierra Leone. It is a classic example of how gaps between the rich and the poor still widen, on a global scale. One of the most widely used concepts in sociology is “social stratification.” Taken literally, stratification refers to a kind of layering. By adding the term “social,” sociologists argue there exist different levels of social layering across all societies, demarcated by measures of inequality. Systemically, social stratification can be measured in three ways: (1) by access to resources/wealth (e.g., money, social networks, weapons, computer technology); (2) power (the ability to influence others, often against their will); and (3) prestige (the status one commands within a society). Sierra Leone is one of the poorest countries in the world. If you don’t know where Sierra Leone is, well, that may be one indicator of its lack of status in the global economy. Speaking of the global economy, the Human Development Index (HDI) ranks countries with regard to overall quality of life based on three major criteria: whether those in the country’s population (1) live a long and healthy life; (2) have access to knowledge; and (3) hold a decent standard of living. According to the 2011 HDI, Sierra Leone ranks 180 out of 187 countries globally, as it still recovers from a brutal civil war that lasted throughout most of the 1990s and up until 2002. In contrast, the top five ranking countries in the 2011 HDI are, in order, Norway, Australia, Netherlands, United States, and New Zealand. This index is one way of saying on a global scale, these countries stand very high in a socially stratified world, whereas Sierra Leone stands quite low in comparison…. How does a female athlete survive in the patriarchal and exploitive world of MMA? “Rowdy” Ronda Rousey, the new bantamweight Strikeforce champion, speaks candidly about how she navigates a hyper-sexualized and hyper-violent profession. In this post David Mayeda explores the patriarchal bargains Rousey openly makes and their consequences. If you’ve ever thought women can’t fight, think again. On Saturday March 3, “Rowdy” Ronda Rousey faced off against Strikeforce’s then bantamweight champion, Miesha Tate. Both women are fantastic athletic talents. Before competing in MMA, Rousey wreaked havoc in judo, representing the United States in the 2004 and 2008 Olympics, winning a bronze medal in ‘08. As foreshadowed, Rousey dethroned Tate, winning via brutal armbar submission in the fight card’s main event (see video highlights, below). Tate’s arm was severely hyper-extended and injured as she refused to “tap out” (submit), rendering this an institutionally sanctioned example of sporting violence (see picture here – warning graphic photo). Scholars have noted that as women navigate their options in patriarchal systems [1. Patriarchy refers to a system where males (fathers specifically) establish and perpetuate their power through formal ownership and control over women, children, and property – older male privilege is strategically built into societal institutions. ], they frequently make strategic “bargains,” assessing gendered rules and scripts specific to the cultural contexts in which they live. Frequently, “patriarchal bargains” occur when women behave in ways that grant them power as individuals, but reproduce the dominant gender order, thereby perpetuating cultural systems that subordinate women collectively…. Indian Americans are increasingly visible in television sitcoms. In this post, Stephanie Medley-Rath explores if the increasing number of Indian American token characters a sign that Indian Americans are “becoming white” through social class and educational attainment. My guilty pleasure is sitcoms. While watching I noticed something recently. Indian Americans[1. By Indian American am lumping all people who can trace their ancestry to India together and am basing my categorization on the character portrayals.] are everywhere! (Maybe MTV will cash in on the trend with a show called 16 & Pregnant Indian American). At the same time Indian Americans are not everywhere. These characters are primarily serving the role of token racial minority character[2. A token character is one that only exists to satisfy the minimum societal expectation. It’s seen as a cynical move by media creators to ward off claims of being racially biased without actually integrating the tokenized group into the story]. Indian American token characters are displacing Black token characters (see Token Black on South Park as a satirical version of the Black token character). Today, token Indian American characters include Kelly Kapoor on The Office, Tom Haverford on Parks and Recreation, Rajesh Koothrappali (and periodically, Priya, his sister and his parents via Skype) on The Big Bang Theory, Timmy on Rules of Engagement, and Kevin on How I Met Your Mother (though he is only a recurring character). I’m sure I’m leaving someone out. I can’t watch every episode of every sitcom after all…. Hegemony is a big word for a fairly simple idea. When socially powerful people use their influence to convince less powerful people it is in their best interest to do what is actually in the most powerful people’s best interest, that’s hegemony. If you had a younger brother or sister, then chances are you’ve been hegemonic before. In this piece Nathan Palmer discusses how hegemony is used to get his daughter to bed and to justify the growing economic inequality in the United States. My 3 year old daughter doesn’t want to go to bed, ever. I used to fight with her, but I found my feeble reserve of late day energy no match for her inexhaustible reserves of protest anger (she takes a mid-day nap- it’s not a fair fight). I have power and authority over her. I am 10 times her size. My mastery of basic intellectual skills pwns her 3 year old set. And yet I’m reduced to begging her and/or God for the mercy of sleep. We’ve been focusing a lot on power and control here on SociologyInFocus, but it’s an election year, so this is to be expected. There are a lot of ways to control/dominate people, but not all of them are as painless or as sinister as hegemony. Let’s go back to my daughter. I have authority, size, and power over her, but using coercion goes against my values and against the laws of my state. So I busted out my hegemony skills. As a result of our current economic downturn, the wealth gap between Whites and African Americans is larger today then any time in the past 25 years. In this post, Bridget Welch explores how historical housing practices and current predatory lending practices combine to reinforce institutional discrimination. Unless you have been living under a rock, or work on Wall Street, you may have noticed that the economy is not doing so well. Just in case you are unaware of how that statement should win “The Most Understated Statement of the Year” award, please watch this short video that shows the spread of unemployment across the United States. Yet, as hideous as the current unemployment rate is, there is a group of people who live on this razors edge constantly. You see, African Americans’ unemployment rate is always at the recession rate. In other words, what makes this current economic downturn so notable is that Whites are now at the unemployment rate that African Americans normally are at. And, of course, African Americans are disproportionately hurt by the current downturn – meaning their unemployment rates (particularly men’s) have soared. Don’t believe me? Go play with this fun NYT infographic. The truth is that minorities in our country act as the canary in the coal mine – falling to the poisonous atmosphere before it reaches the rest of us….